For many, the road to law school success seems blocked by obstacles and filled with potholes. But learning the law and getting good grades on your law school exams is really not that difficult. You just need someone to show you the way. 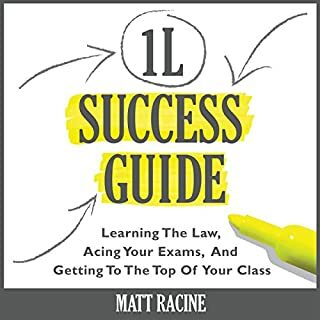 The 1L Success Guide was written by someone who graduated #1 in his law school class. He shares the methods by which he learned the law and aced his law school exams, earning 9 high-paper awards in the process. Good book for some quick tips. Written by students, for students, Law School Confidential has been the "must-have" guide for anyone thinking about, applying to, or attending law school for more than a decade. And now, in this newly revised third edition, it's more valuable than ever. This isn't the advice of graying professors or battle-scarred practitioners long removed from law school. Robert H. Miller has assembled a blue-ribbon panel of recent graduates from across the country to offer realistic and informative firsthand advice about what law school is really like. Are you looking to dominate the LSAT and land a spot at your dream law school? Let's LSAT! is a valuable collection of 180 tips from 180 top-scoring LSAT students from across the nation! These unique tips, tricks, and techniques, many of which have never been published before, can help you get an insider look at how the test works and give you an incredible advantage. Here is an exceptionally clear introduction to law, covering the main subjects found in the first year of law school, giving us a basic understanding of how it all works. Listeners are introduced to every aspect of the legal system, from constitutional law and the litigation process to tort law, contract law, property law, and criminal law. Feinman illuminates each discussion with many intriguing, outrageous, and infamous cases. 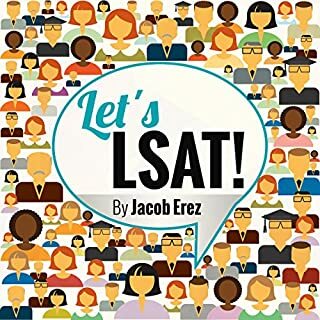 Developed by experienced professors and professionally narrated for easy listening, this course is a valuable tool when preparing for your Law School Admission Test (LSAT). 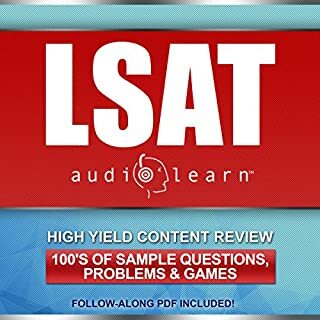 The audio is focused and high-yield, covering the most important topics you need to know to succeed on the LSAT. The material is accurate, up-to-date, and broken down into bite-sized chapters. There are quizzes and key takeaways sections following each chapter to review questions commonly tested and drive home key points. Where is the freaking PDF???? By: Ann K. Levine Esq. Learn everything you need to know to get into law school. 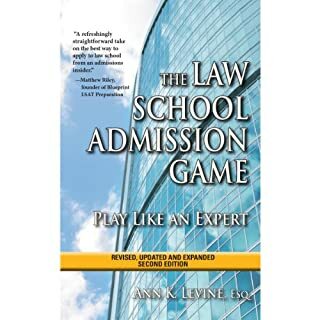 This re-written and completely updated version of the bestselling law school admission guide, first published in 2009, provides detailed information on how to present yourself in the law school application process. By: Timothy B. Francis Esq., Walter C. Jones Esq., Lisa Jones Johnson Esq. So You Want to Be a Lawyer takes you through the process of becoming a lawyer, examining each phase in a helpful and easy-to-understand narrative. Find out what practicing law is like before you step into your first law school class! Practice solving legal problems as law students would in law school, and lawyers might in an actual courtroom. Law School. Those two little words are probably all you’ve been thinking about since you made the decision to become a lawyer. Good for you! If you’re seriously considering law school, you know that there’s one big hurdle you still have to leap in addition to graduating: the Law School Admissions Test. One of the more troubling questions you probably have on your mind is when - and how - to study for this oh so important test. Well, we have the answer. Don't take the LSAT without developing this vital skill first! We've helped numerous students improve their score with a simple trick that gives them a shocking advantage over the competition. Get a higher LSAT score, and get into the law school of your dreams! This is a unique mastery program that does more than just build your vocabulary - it teaches you to read using context clues, helping you understand the vocabulary words on a deeper level. Don't just memorize your vocabulary words - master them! Ripe with relatable tension and a sprinkle of humor, A Cadre of Experts thoroughly details essential LSAT concepts and exam strategies, all told through the growing friendship between Alexandra and Noah as they travel the country to consult with various experts in preparation for the exam. More than anything, Alexandra wants to go conquer the LSAT and get into a great law school. Will she succeed? We are witness to the emotional roller-coaster that Alexandra rides, sharing the highs of overconfidence and the lows of discouragement that many students face. AudioLearn Law School Course Outlines presents Tort Law. 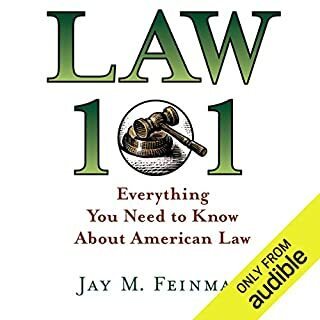 Written by distinguished law professors and professionally narrated for easy listening, this outline covers what is typically taught in a law school tort law course. Included are detailed explanations of critical issues and topics you must know to master the course. A history of the landmark case of Clarence Earl Gideon's fight for the right to legal counsel. 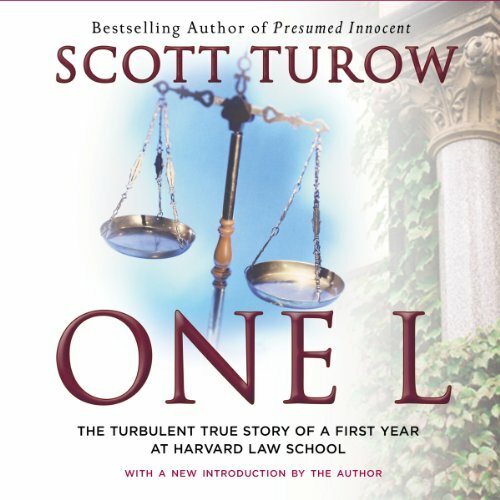 One L, Scott Turow's journal of his first year at law school and a best seller when it was first published in 1977, has gone on to become a virtual bible for prospective law students. Not only does it introduce with remarkable clarity the ideas and issues that are the stuff of legal education; it also brings alive the anxiety and competitiveness, with others and, even more, with oneself, that set the tone in this crucible of character building. Each September, a new crop of students enter Harvard Law School to begin an intense, often grueling, sometimes harrowing year of introduction to the law. Will the One Ls survive? Will they excel? Will they make the Law Review, the outward and visible sign of success in this ultra-competitive microcosm? With remarkable insight into both his fellow students and himself, Turow leads us through the ups and downs, the small triumphs and tragedies of the year, in an absorbing and thought-provoking narrative that teaches the listener not only about law school and the law but also about the human beings who make them what they are. One L brought insight into the self-induced psychopathology that first year students bestow on themselves, as well as the misdirected, flip pieces of advice that professors give to students undergoing a great deal of stress. I also became very interested in learning the basics of the law. I never knew what "torts" were until I listened to the story. I was impressed with the liveliness of the narration, and the clear writing as well. While some explanations rambled a bit, I was very interested in hearing Turow's story, and listened to the story straight through. I have new insight to the world my lawyer friends went through in their first year, and greater understanding why many of them exhibit the aggressive, combative personas when I talk with them. Turow wrote the book while undergoing law school, and the tone of the narrator's complaints and demonizing remarks sometimes come across as immature and whiny. Nonetheless, the narrative felt authentic, and I was engrossed in Turow's progress. Still a great choice 30 years later! Basically just a mildly interesting look at law school. I wasn't disappointed in my use of a credit as it was just as I suspected it would be. However I can't in good faith recommend it unless you like me are interested in the vicarious experience. Not really a well developed novel, rather a documentation of his experiences at Harvard. What did you love best about One L? It pretty much laid out a blueprint of everything to expect during the first year of law school. I listened to it a few weeks before school started and it really helped me get into the right mindset. Perini. Are all contracts professors alike? Or maybe the Harvard Law contracts professor character in The Paper Chase was based on the same Harvard Law contracts professor that Turow based Perini. When he was about to have a nervous breakdown and tried to see the on-campus psych, but then things got better... Cheesy, I know, but I've definitely thought about it. It's a good motivator. Would recommend to ALL future 1Ls. Absolutely. John Donne, amongst others, wrote that comparisons are odious. My experience of Scott Turow's recollections of his first year at Harvard Law School suggests that this is not always true. I went to Law School in Australia in the early 80's. My first two years (here we once split the first year of law over two years in combination with part of a sympathetic second degree, in my case Commerce) bore very little resemblance to his. In some ways heading his memoir I felt like I'd been deprived the trial by ordeal that he endured. Like all competitive people I suspect, I am not sure whether I am glad or disappointed by this. Having said that, some of the themes he described were common; the bright eyed wonder when I actually enjoyed it, the searching for relevance and the diametric pull between the lure of the dollar and the demands of a system intended to promote a just result. Overall I found his insight rivetingly interesting and I paused to wonder at his maturity at 26 to write an account which is as profound as I regard it to be. Holter Graham's performance was good too. He delivered it convincingly and consistently with the young Turow's emotions laid bare on the page. In a work of this sort I wanted him to be the vehicle for the words, which is what he was. He could have lost the listener if it became about him, but he did not allow this to occur. Finally, it would be remiss of me not to note the lengthy postscript that Turow adds at the end of the audio. It added appreciably to my enjoyment of the original text. The audio interview was so-so, but Turow's own observations on being a lawyer rang a strong and resonant chord with me. I personally endorse what he says about the role of the practice of the law and its continuing disconnect with the way young lawyers are taught. I would highly recommend this book to anybody considering law school. There is no other book of its kind...it will definitely give you an idea as to what you're in for. I haven't been to law school so I can't really comment on how valuable it may be as an aid to first year students. But the author and his classmates come across as self-absorbed children. They consistently missed the larger lessons of what the law professors were trying to get through to them and instead felt abused, and mistreated. This book represents one man's recollection and interpretation of one section, of one year at one law school. But if it's accurate, it explains a lot about why people tend to not think highly of lawyers. You can really feel what the author is feeling as he writes in his journal about his first year. I don't agree with his politics, and think some of his fears may have been misplaced, but I haven't gone to Harvard Law School, so I can't comment further. This book is a bit outdated--Turow was a One L in 1975--but his story expresses themes universal to the One L experience. If you are a One L or have been one, you will surely identify with Turow. 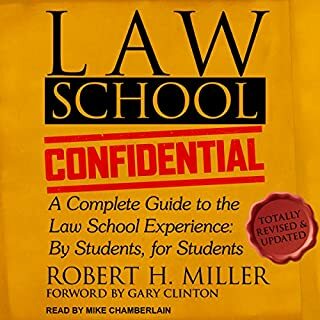 If you are headed to law school, this makes good book to read before you go, to help you mentally prepare for the experience! In any case, Turow is a terrific writer and this is a good memoir--he admits to his downfalls and challenges in a way that makes him, and all the people at HLS with him, students and professors alike, sympathetic. You'll enjoy it. great story telling. I listened to it and was able to pictures the class rooms, situations and drama throughout the first year.